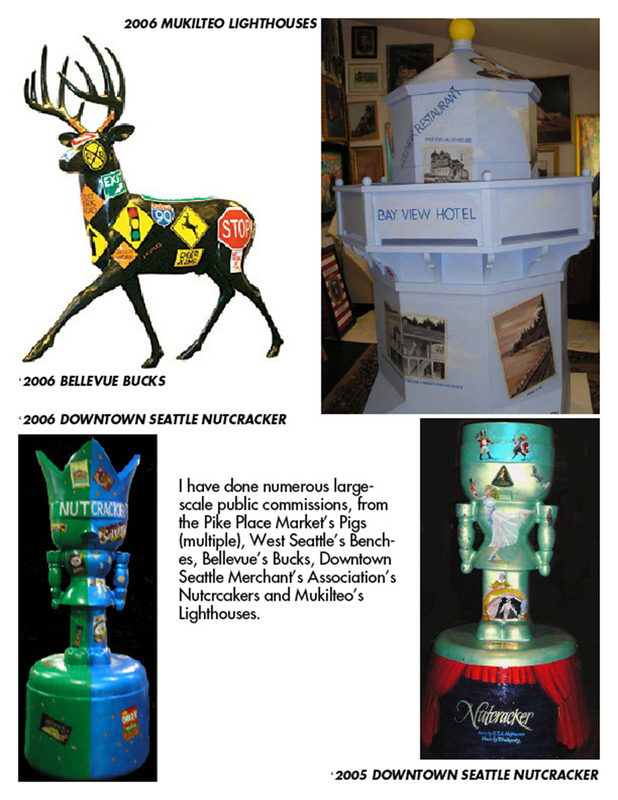 A fund-raiser for people with disabilities jobs programs,I painted 6 giant Nutcrackers. 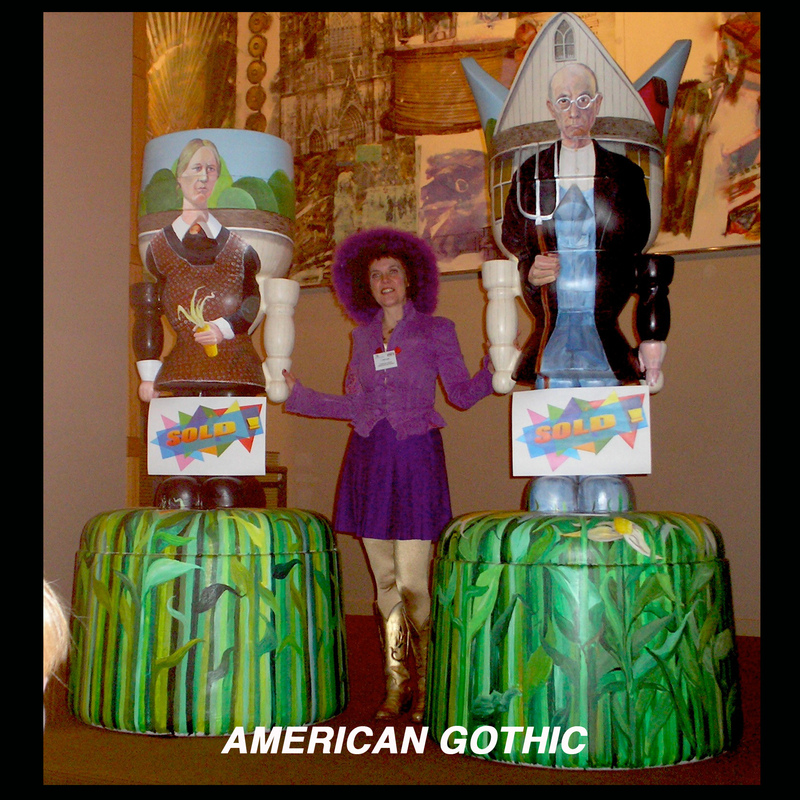 These 2 were the iconic American Gothic farmers. Acrylic on Fiberglass. 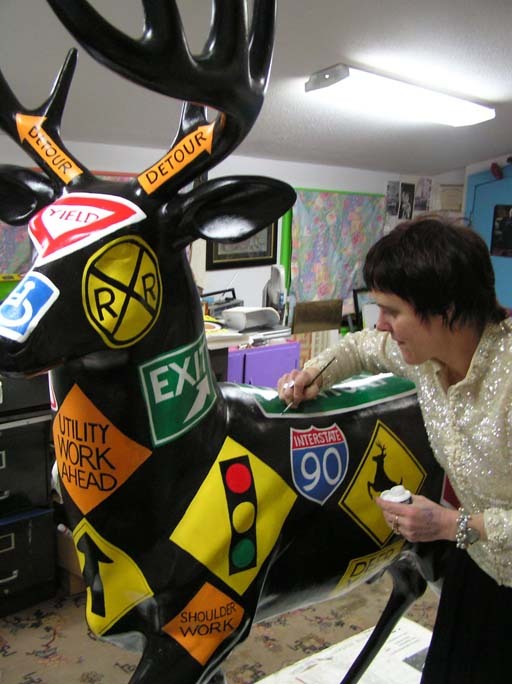 Fiberglass Bucks were a fund-raiser for P.A.C.E. 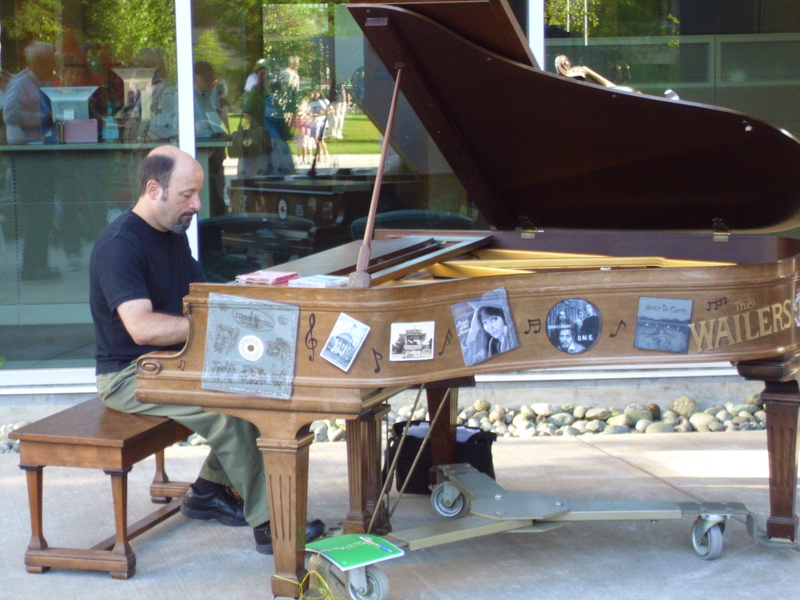 (Performing Arts Center of the Eastside). I painted 3 of the deer. 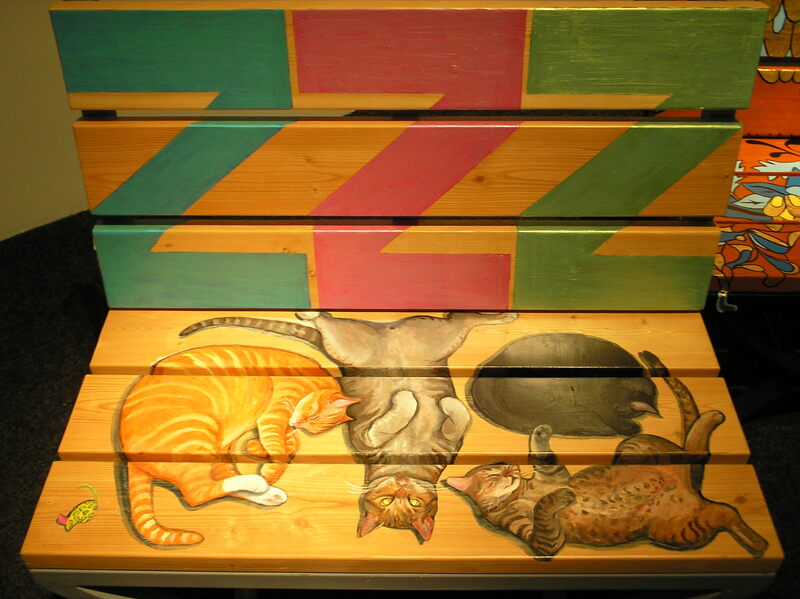 Snoozing cats painted on a (commissioned) wooden 3' bench. 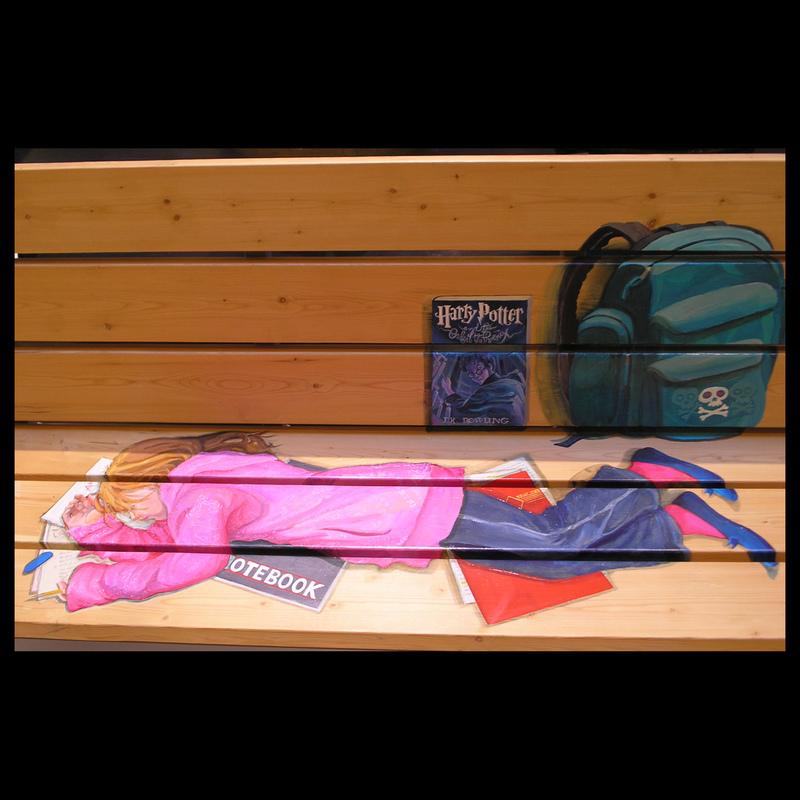 I painted 4 benches as a fund-raiser for P.A.C.E.. This one was a pre-teen asleep on her homework, school supplies scattered about. 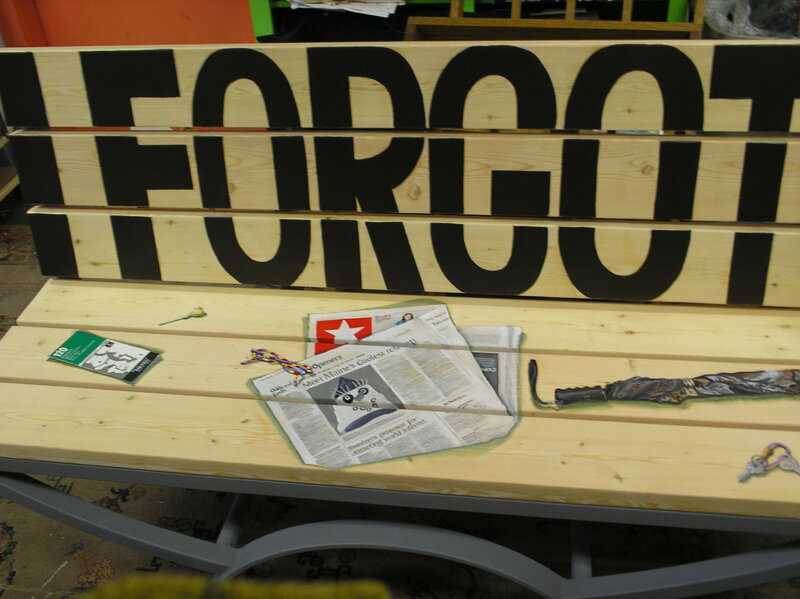 Acrylic on wooden bench. 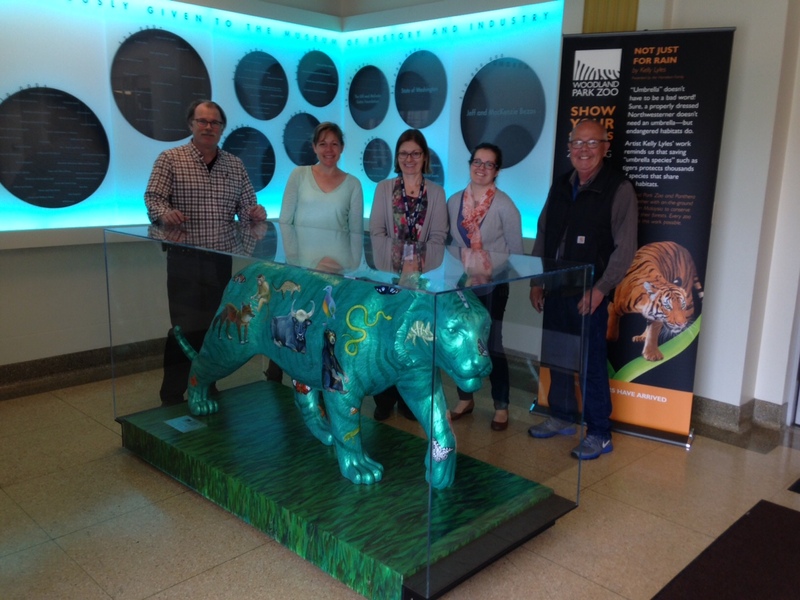 Another Public Art commissioned piece for a Zoo fund-raiser, I painted the (many endangered) animals found in tiger's habitats. 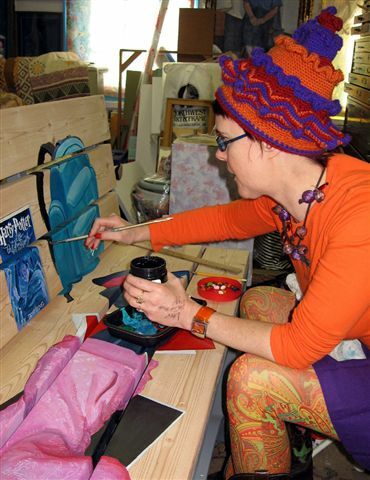 Acrylic (& iridescent) Paint on Fiberglass. 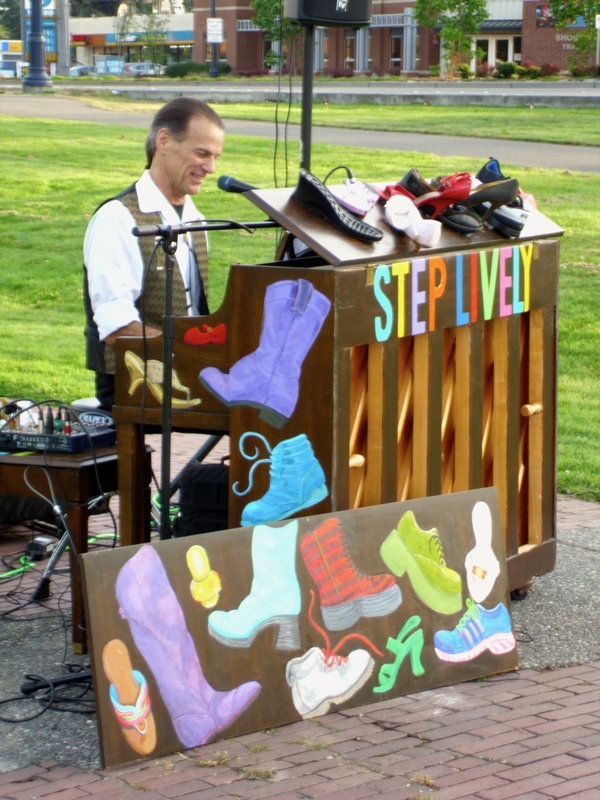 Hand painted WA state musicians (albums & musical ephemera) for the annual Shoreline Pianos project. 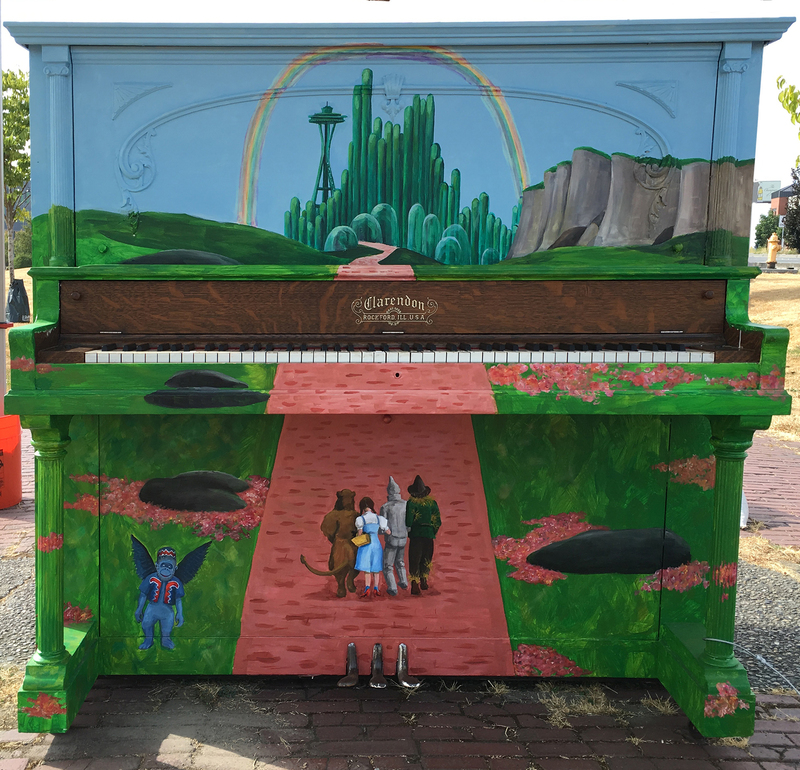 Another public art painted piano, this one referencing Shoreline's red-brick (sculpture walk) road `a la WIZARD OF OZ. A P.A.C.E. 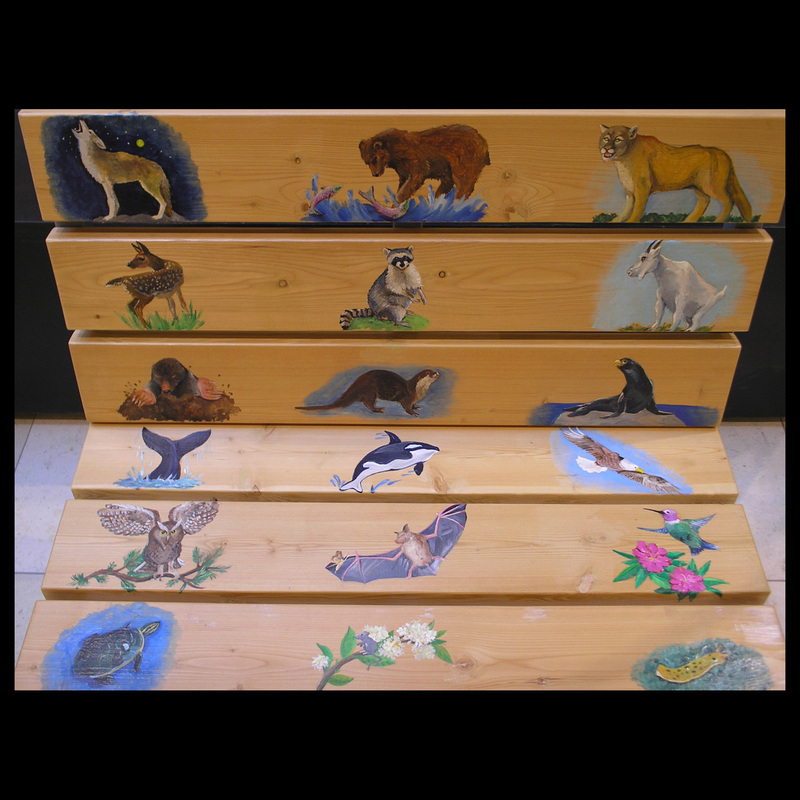 fundraiser, I painted 6 of these wooden benches in Trompe L'Oeil style. This one represents all the items easily forgotten whilst waiting for a bus. 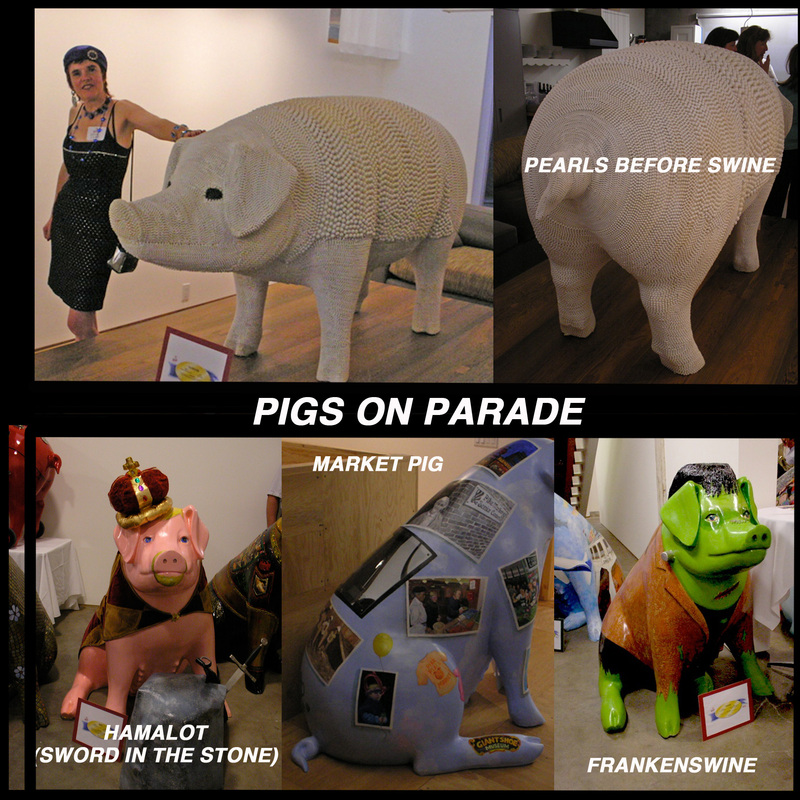 Seattle's PIKE PLACE MARKET's mascot is Rachel the Pig, so their fund-raiser involved decorating/auctioning fiberglass pigs. I created 6 (HOG-WILD, FRANKENSWINE, PEARLS BEFORE SWINE, HAPPY AS A PIG IN MUD, HAMALOT, & MARKET PIG).